This is one of my favorite sayings!! I combined it with this precious floral design because they seemed such a perfect fit. After all, just because we wear aprons to work, doesn't mean we cannot have fun while we are moving our many mountains!! What is GREAT about Louisiana??? Well this little guy combines all the things that are GREAT about Louisiana - Fleur de lis, crawfish and Mardi Gras!!! 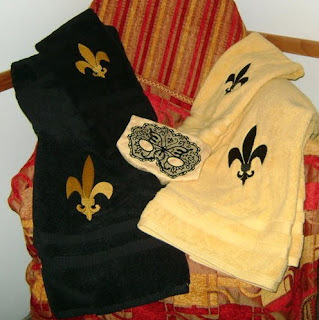 This is different from my earlier posts this week and just show what character a fleur de lis can possess!! 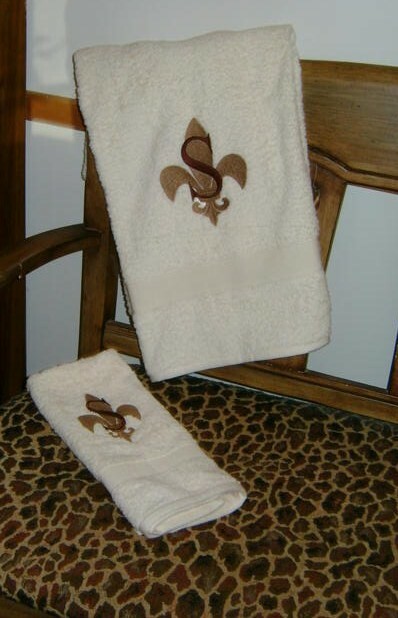 Like I said on Saturday, Fall and Fleur de lis just go together perfectly!! Fall and Fleur de Lis, a PERFECT fit!! I am so excited with the way my Fleur de Lis have turned out!! While the traditional set of Saints towels is always popular, my Fleur de Lis towels with initials are truly elegant!! What is next for Fleur de Lis on the horizon? I am making Fleur de LC aprons and Fleur de Baby items too!! Yes, and featured with the Saints towels is one of my lace Mardi Gras masks. You will be seeing a lot more of these as well! !